Joe Allen, the illustrious subterranean Covent Garden restaurant forced to close as its present location is being turned into a hotel, is to be recreated “brick by brick” in a new location just 40 yards away. Its distinctive features – brick arches, the tongue and groove wood panelling, the bar top, light fittings, posters of West End plays, and chairs and tables – are all going to the new premises in nearby Burleigh Street. Below is an account I wrote after a visit in 2015. 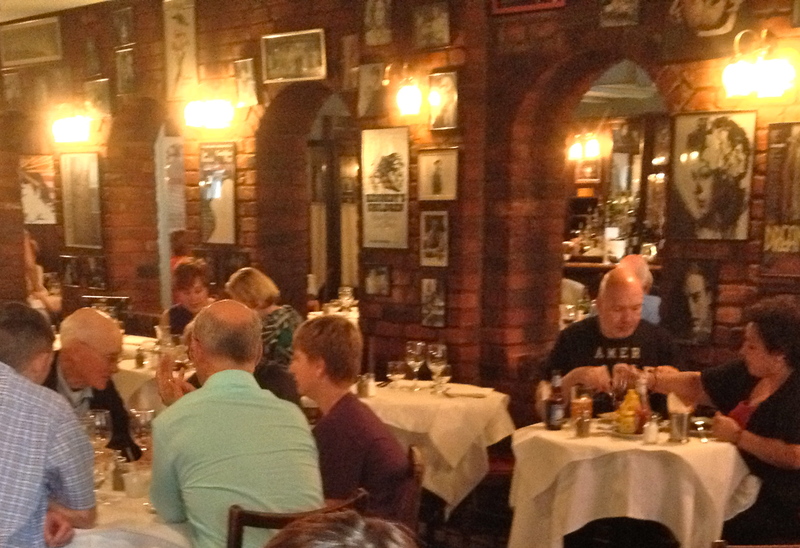 I don’t know of a restaurant in the West End like Joe Allen, discreet, below street level, down a flight of stairs. There is a tempting touch of mystery about it, set apart from regular places on the pavement, not so easy to find, hinting at private events, by personal invitation only. Perhaps New York restauranteur Joe Allen, when he opened this subterranean place in January 1977, thought actors and other theatre people wanted to be somewhere out of eyeshot, away from the gaze of passing fans and other theatergoers. These he attracted in droves, just as he had in his original namesake restaurant in New York, which he opened in 1975. But Joe Allen (the place) always was open to everybody, serving those great American staples – steaks, grills, burgers, ribs, wings, and salads, Ice cream, jellies and brownies – with relaxed and friendly service. You just had to find it, and walk down those stairs. Changing circumstances meant we hadn’t been to the restaurant since its earliest years. We’ve been back twice so far this autumn (2013). We didn’t spot anybody we recognized on either of our visits, but then we weren’t looking. It was enough to drink in the many theatre posters of classic musical and stage productions, with random photographs of actors, which almost entirely cover the plain brick walls from eye level to ceiling. Joe Allen changed hands at the end of 2012, when longtime owner Richard Polo decided to retire. Three partners bought it, restaurateurs Tim Healy and Lawrence Hartley, who both run successful places in West London, and Carluccio’s chairman Stephen Gee. They’ve come in with energy and enthusiasm. That is quite a different approach from Joe Allen himself, a native of Queens in New York,when he was setting up his namesake chain – there are more in Paris and Miami. He told a New York Times interviewer he was never overburdened with ambition. He described his personality as “minimal.” “The compelling reason I got into this business is that I like hanging out in bars,” he said. He had worked as a cashier and bartender, before opening the original Allen’s in New York’s theatre district with a friend. It’s when places are bought and sold that diners feel, for one of the few times, anxiety on their side of the table. (Usually it’s the kitchen that does the worrying.) Will the menu change? Would the posters and photographs of 70s and 80s shows and actors be replaced or updated, or even replaced with posters of flops, as Joe Allen features in New York? Would they change the layout and let in some light? No such cynicism at Joe Allen’s, or with its PRs, however. The new owners came in with full respect for the place – Tim had been here as a boy and his father’s photograph hangs on the walls – and a determination to keep the restaurant, “the ultimate American dining experience in London”, exactly as it was. Give or take some minor changes: modernizing the kitchen for example. There’s a new eye-catching red awning above the door in Exeter Street, but the stairs down are the same as ever, leading to the barrage of (current) theatre posters on the wall next to the cloakroom, then a sharp left turn into the bar and first part of the restaurant. We were told many of the old staff – some dating back 25 years – are still here. If you are booking, it’s worth asking for one of the several tables for two, on your left against the partition wall as you walk into the main part of the restaurant at the kitchen end. From here you can peruse the whole of the restaurant without making it too obvious. On our evening visit I ordered chopped liver with pickles and sourdough toast, followed by dry roast back ribs with red slaw and barbecue sauce. And a carafe of Baccaria Nero d’Avola, from Sicily. There is a wide choice on the wine menu, and, as you might expect, some authentic American beers, including Brooklyn Lager on tap. They also serve Blue Moon wheat beer, Colorado; Anchor Steam beer, San Francisco, and Huber premium beer, Wisconsin. Our deserts were strawberry jelly and peanut ice cream, and pecan and cranberry pie. It would be silly to try to compare this with our meals of 30 years ago – as if we could remember – but the food was good, up to the mark American brasserie fare, and promptly served. It was a busy night, but our waitress did apologize for the delay to our coffees – the machine was being replenished with a fresh supply. They also serve an attractively priced set menu – two courses for £16.00 with a complimentary glass of house wine, available any time Sunday to Tuesday, and noon till 7pm Wednesday to Saturday. In a blog interview Tim and Lawrence outlined the policy in the kitchen. They have kept the favorites, such as Black Bean Soup with Coriander, while introducing new tastes – Crispy Squid with Anchovy Mayo, for example. They still keep a strong focus on Grills: steaks are from 28-day aged Hereford cattle. Diners may choose steak and size – sirloin, rib eye, fillet or rib eye on the bone. Sauces include traditional Bearnaise, Chipotle Hollandaise and an Avocado, Lime & Coriander Salsa. They’ve tweaked the Chilli Con Carne with Guacamole and Sour Cream and Corn Grits, using chunks of meat rather than mince, and adding a little chocolate to give it a lift. 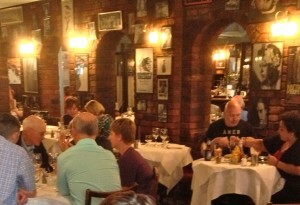 Since our visit the website easyliving.co.uk placed Joe Allen’s on its bucket list of 35 London restaurants. What do I think of Joe Allen’s? You would expect any restaurant under new, committed management to feel fresh and revived in the first year or two. And it certainly does. There’s going to be a confidence boost, to ricochet off the walls and cannon onto the tables. I would like to check back in three or five years. In the meantime I’m pleased to announce that the new owners have made a good, and more importantly a very unobtrusive (in terms of any noticeable change), start to their new regime.